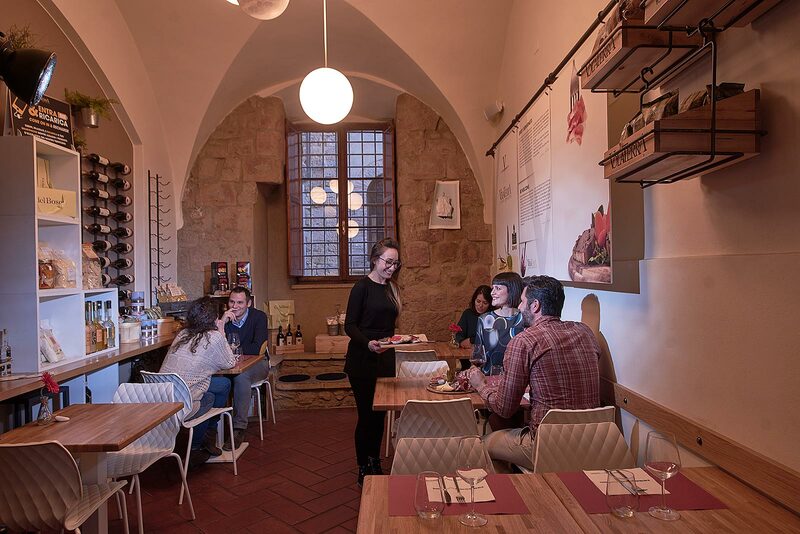 We created a space that we at first would have wanted to have in our city, a place that offers a creative and welcoming atmosphere, where people can share relaxed moments and get to know the real Tuscany. Not only lunches and aperitifs, at Volaterra we host art exhibits, events and private parties, cultural and musical evenings. 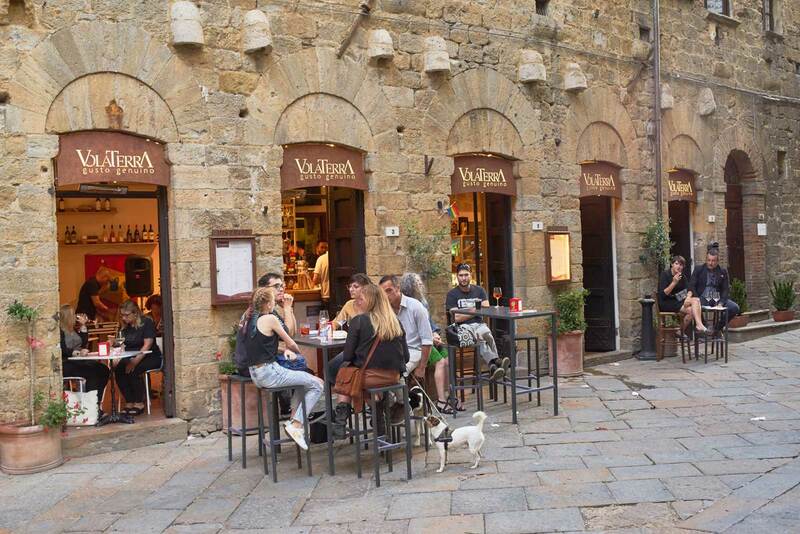 It is a modern environment, in the centre of an ancient city as Volterra, where past and present coexist. The charm of the tradition is combined with the desire of discovery. For us the ingredients are the most important things and come as first. 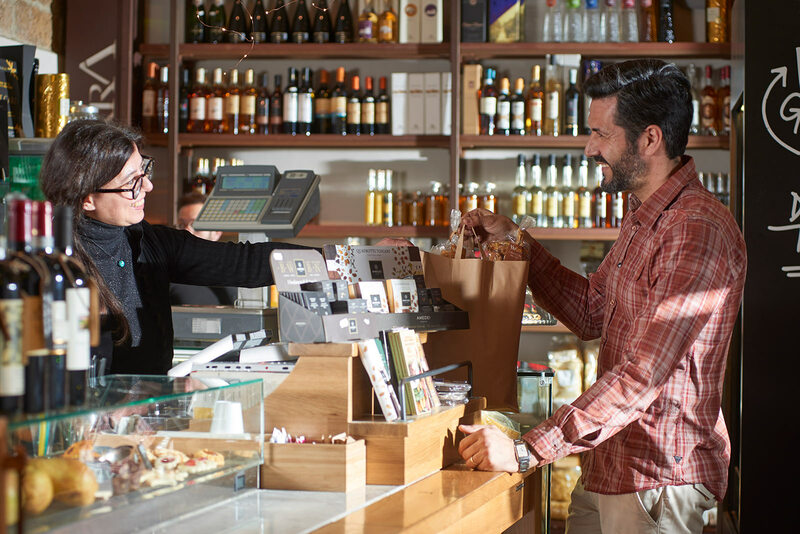 Our shelfs are our business card, here you can discover products from our land that we carefully selected and by getting to know each producer. Each product is served and told with passion by our staff, who will be happy to make you taste it and know it. The best Tuscan excellences are at your disposal: you can taste them at the table or you can take them home, your choice. The journey to discover Tuscany starts from here, from our counter. Not only flavours, but also colours. The bistros have always been some of the favourite places for artists. What combines taste for food and taste for art is the enhancing of beauty: being able to grab and enhance the sensation of an instant, through a flavour, a poetry or a painting. 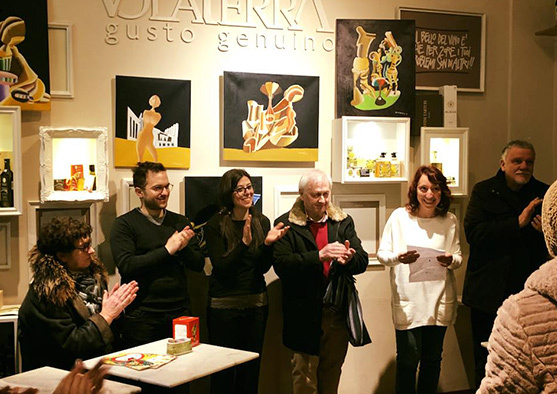 At Volaterra we host art exhibition, we organize meetings with the artists and we have fun by mixing culture, art, cooking and performances. 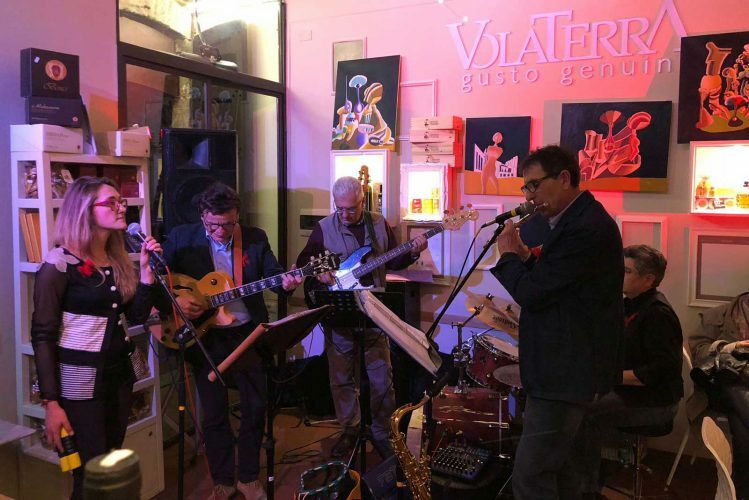 Volaterra is an inviting and relaxing place where you can enjoy intimate moments but also evening accompanied by the “good living Here you can spend nice moments with friends, good wine and a chopping board (Cold cuts). Our events calendar represents what are our interests, what we want to transmit and share with you. Not only tastes, and kitchen/food/cuisine, but also art, culture and music. Here you always find something new to taste, look and listen to. 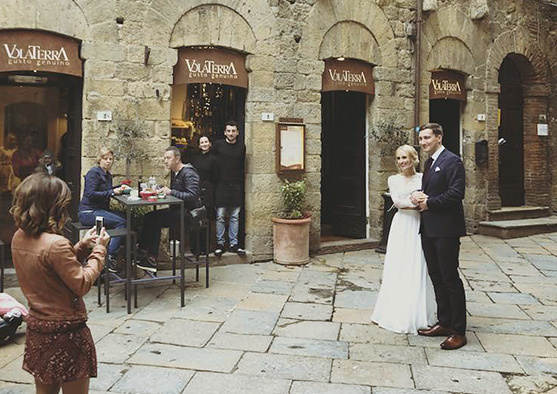 If you decided to celebrate your wedding at the Palazzo dei Priori, after the ceremony, stop at Volaterra to celebrate your first toasts with all the guests! We are located in an ancient and suggestive palace, down the street from the Priori square. Moreover, if you want to organize an aperitif or a buffet for a party, a birthday, a graduation or a wedding, the Volaterra Bistro can become yours for a day! We offer our spaces and we put at your disposal the rooms, products and our prepared staff. Volaterra only offers to its customers the best of the Tuscan wine tradition. 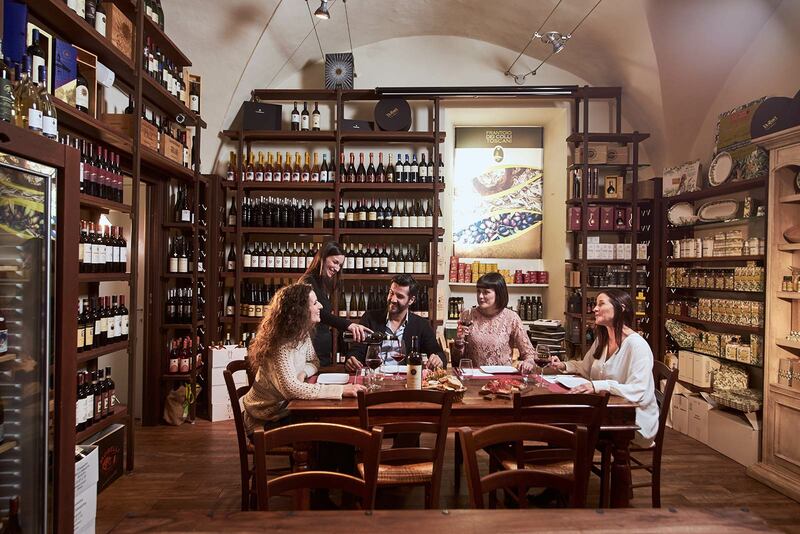 The personal knowledge of the land and of the Tuscan wine cellars allowed us to gather a wide and accurate wine selection. Our passion is not only pointed towards choosing the best labels, but also towards offering peculiar tastings and combination with the dishes from our menu, so to taste them following the conviviality that you can find in the bistro. From his previous experiences and his strong passion for his land, in 2012 he decided to do something new in his own city, Volterra. This is how the bistro Volaterra, the homonimous holiday house and the Osteria dei Fornelli restaurant were born. In April 2017, he was elected president of the young entrepreneurs Confesercenti of North Tuscany. Young, prepared and passionate, our 100% Tuscan staff loves to make their guests discover the Tuscan beauty, in all ways possible. Whether this is a monument, a landscape, a flavour, a fragrance or a colour, the boys and girls of Volaterra will be able to welcome you and to tell you our excellences or simply to make you feel comfortable in a welcoming and inviting environment. Sign up to the newsletter to know what is happening at Volaterra, you will receive invitations for evenings, events, courses and tastings.